February is here, which means competition prep season is in full swing. It’s a season brimming with paperwork, head shots, mock interviews, talent practice…and stress. But preparation doesn’t have to be that stressful and I’ve realized — a lot through trial by error — that there are several strategies that can alleviate stress and leave you feeling confident when you walk into competition day/week. It’s no secret that women in the Miss America Organization lead very busy lives. Some are in school full time, working full time, engaged in extracurricular activities, etc. It can be so hard to find time to prepare! I know for myself that my senior year was the busiest I’d ever had. What helped was catering my preparation to my lifestyle and not the other way around; I found ways to make my preparation happen without drastically altering my schedule. At a Utah Campus Compact retreat with my Bennion Service Center friends. 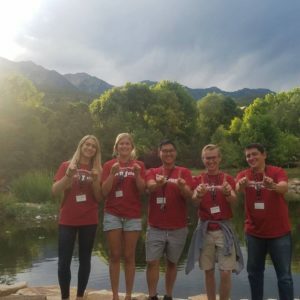 For example, I would listen to current events podcasts in the morning while doing my makeup, pretend I was on the phone as I walked across campus answering interview questions, took classes that helped me further my career, and engaged in community service activities and positions on campus that corresponded with my platform. Bottom line: there are so many ways to make your preparation fit with your busy schedule. Me and Miss Utah 2017 JessiKate Riley after receiving a preliminary talent award. Who hasn’t wanted to win a preliminary, place in the top five, or win? But if goals are solely based on a judge’s decision, then that will more than likely leave you feeling disappointed. Judges have different opinions on different days; you cannot control what a panel of five to seven individuals decide, but you can decide and control whether or not you are successful. One of my good friends, a former titleholder, told me how she wanted to win a Lifestyle and Fitness preliminary award but how her larger goal was to get a six-pack. She didn’t end up winning the preliminary but she did develop a six-pack. She walked away feeling successful because she accomplished what she had set out to do! Set both short and long term goals that bring you closer to success. Doing something each day to fulfill those goals will leave you feeling so prepared, confident, and satisfied with your performance; you will know that you gave it your all. It doesn’t have to always be a huge act either! Whether it’s choosing eggs over French toast in the morning, taking time to read the latest headlines on the 2020 Presidential race, or doing some online shopping for wardrobe, you can do something each and every day. Make a plan for what you want your preparation to look like. If you map it out, it will be easier to manifest it and those close to you in your life can help you stick to your plan. Plan for Miss Utah week essentials, your wardrobe, spare wardrobe, your talent performance, interview, etc. I’m someone who usually procrastinates wardrobe planning and it was hard to push myself to search for evening gown dresses in advance, but it alleviated so much stress and it was crucial that I did that before the dress inventories were drastically reduced. Every competition phase requires looking ahead and planning ahead! Preparation isn’t easy and if you want to do well then working hard is the only option. Ask any titleholder in the world and they will give you the same advice. This means that preparing more than six weeks in advance and being extremely disciplined is absolutely mandatory. 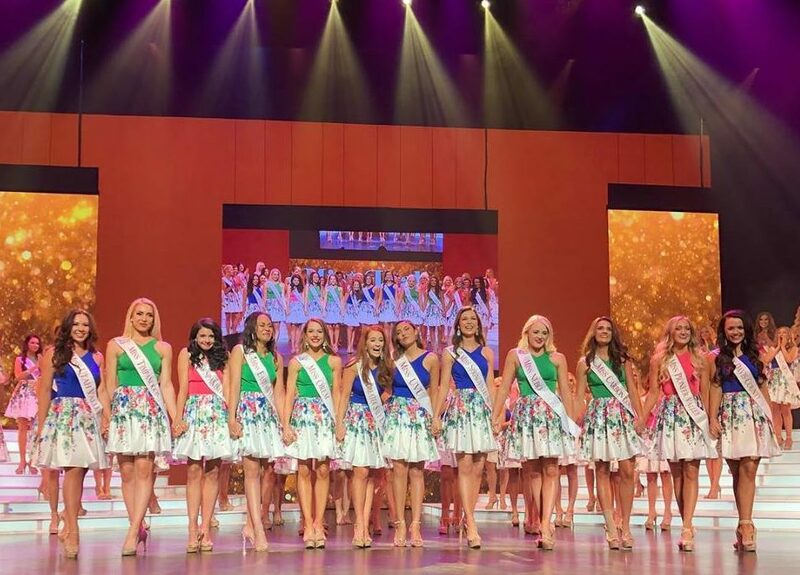 The 2018 Miss Utah Scholarship Pageant Top 12 Finalists. Performing at your best for any competition requires dedication and sacrifice. It means that some of your Friday nights should be spent researching hot-button issues instead of going to parties, and that extra talent practice will have to replace your usual “The Office” viewing time. One of my favorite success stories is my Mom’s: she competed in Miss Orem and placed last in every area of competition. A few months later, she competed in Miss Utah Valley which was one of the hardest locals. The local included women who were former Miss USA contestants and women who had placed in the Top Five at Miss Utah… and she won. She won because she worked so hard to become better and her hard work paid off. Because she maintained that work ethic, she later became Miss Utah. Nothing can truly replace that kind of hard work and commitment. Isaac Newton said, “If I have seen further it is by standing on the shoulders of Giants,” and that, in a nutshell, describes how I became Miss Utah. Over the past few years, I’ve met with so many women and men who have experience within the Miss America Organization. Former Miss Utah’s, former local titleholders, judges, friends, and more have been kind enough to meet with me for advice, interview prep, walking prep, and talent prep. Getting a wide variety of opinions and advice was so helpful for me because I was able to distill all the advice into the essential elements that resonated with me. I was also able to make so many friends and develop a deep connection with and love for the Miss Utah community. I firmly believe that I am where I am today because of all the help I received from people with experience. This is so important. Participating in these competitions requires an extreme amount of vulnerability and so you need to have a group of people who you know you can trust no matter what. You want to have people who have your back especially when it gets really intense and you need a shoulder to cry on. 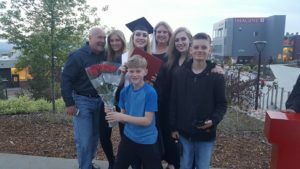 My family and greatest support system at my 2018 University of Utah graduation. If there are toxic people who will only support you if you win, who compare you to others constantly, or who don’t have your best interests at heart, then you need to make sure that you put distance between yourself and them. Negativity is so difficult to deal with while preparing, and you want to spend time with people who build you up and believe in you. “Marie Kondo” your relationships so that you can feel as happy and joyful as possible going into competition. Be with people who make you feel alive and confident! My people were (and are) my family, boyfriend, local directors, and very close friends. I knew that they would love me whether I placed or not and they were there for the times I cried as well as for the times I celebrated! My Mom always told me that preparation was like a ball: if you don’t focus on inflating each part of the ball, then it can never bounce. If you solely focus on talent or interview, then the other areas will suffer. One time, I went out to dinner with a few pageant friends a few weeks prior to their competition. One ordered chicken and vegetables and the other ordered something less healthy. The one who ordered something less healthy said that she didn’t want to win the swimsuit competition so it didn’t matter what she ordered. Although her goal may not have been to win swimsuit, that mindset can be extremely destructive. 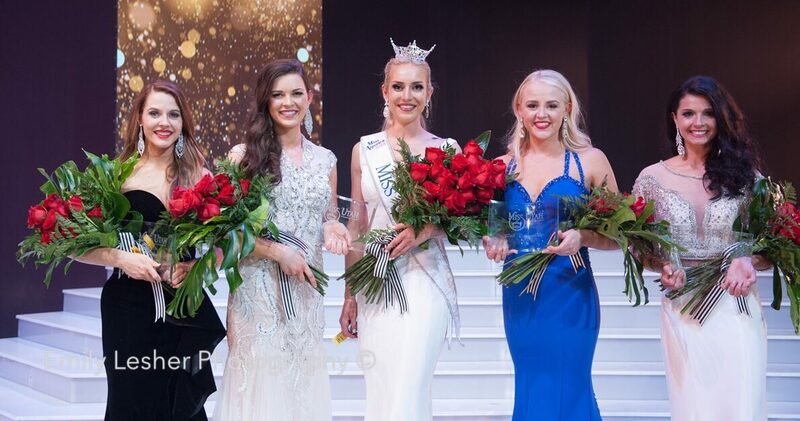 The Miss Utah 2017 preliminary winners and Brittany Wiscombe Tait. Each person prepares in their own way but each area deserves equal focus. Sometimes that extra practice you put into an area of competition you’re not as excited for could result in you placing in the finals as opposed to not placing at all. Trying to be the best you can be in each area of the competition will result in success and when it becomes extremely competitive, it makes all the difference. It can be so tempting to compare ourselves to others, but comparison will always be the thief of joy. Some women may have buckets of success with their social impact initiative, others may be slaying the social media game leading up to competition, but whatever other women are doing…that is not your concern. Put your blinders on, focus on your own progress, and don’t think about how you measure up. I won’t lie and say that it’s been easy to solely focus on myself because it hasn’t been. Sometimes I slip up. But what I’ve found is that when I focus on others, my self-esteem suffers, I lose confidence, and it only hurts me. Preparing for my third year of the Miss Utah pageant, I decided to only focus on being better than I was the previous year; I focused on being better than 2017 Jesse. That focus helped me to feel most confident! 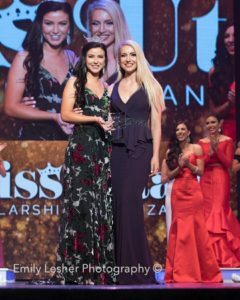 As a result, I had a really interesting experience while competing at the the 2018 Miss Utah competition. I had really wanted to win the Lifestyle and Fitness preliminary award but that didn’t end up happening, but I was surprised to find that I was completely fine and calm after I didn’t win. I looked at the bigger picture, kept calm, and moved forward because I was determined to stay focused on the larger goal at hand. I was still happy for others and felt gratitude and joy because I only focused on my individual journey. Preparation can be really fun and an experience where you experience significant personal growth. Make the effort, work hard, and success will be inevitable! This was FANTASTIC!!!! EXCELLENT points. What a helpful article for contestants.